Brown owes its founding to the support of learning among a Baptist Church association but in 1762, the Baptist Minister Morgan Edwards was at first ridiculed for suggesting the founding of a college. In his Materials for a History of the Baptists in Rhode Island, Edwards wrote:”The first mover [Edwards, himself] for it [a Baptist college] in 1762 was laughed at as a projector of a thing impracticable. Nay, many of the Baptists themselves discouraged the design (prophesying evil to the churches in case it should take place) from an unhappy prejudice against learning.” Nonetheless, Edwards joined several others as an original fellow or trustee for the chartering of the College in the English Colony of Rhode Island and Providence Plantations (the former name for Brown University), the first Baptist college in the original thirteen colonies, and now one of the Ivy League universities. In 1763, The Reverend James Manning, a Baptist minister, and an alumnus of the College of New Jersey (predecessor to today’s Princeton University), was sent to Rhode Island by the Philadelphia Association of Baptist Churches in order to found the college. At the same time, local Congregationalists, led by the theologist Ezra Stiles, were working toward a similar end. The inaugural board meeting of the Corporation of the College in the English Colony of Rhode Island & Providence Plantations was held in the Old Colony House in Newport, Rhode Island. Former colonial governors of Rhode Island Stephen Hopkins and Samuel Ward, as well as the Reverend Isaac Backus and the Reverend Samuel Stillman, were among those who played an instrumental role in Brown’s foundation and later became American revolutionaries. On 3 March 1764, a charter was filed to create the College in Warren, Rhode Island, reflecting the work of both Stiles and Manning. 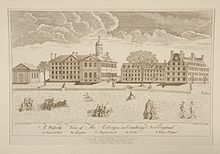 Contrary to popular belief, the college did not gain its charter by grant of King George III; rather, its charter was granted in the form of an Act passed by the Colony’s General Assembly. The charter had more than sixty signatories, including the brothers John, Nicholas and Moses of the Brown family, who would later inspire the College’s modern name following a gift bestowed by Nicholas Brown, Jr. 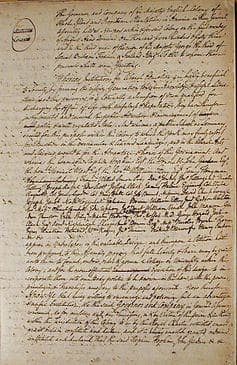 The college’s mission, the charter stated, was to prepare students “for discharging the Offices of Life with usefulness & reputation” by providing instruction “in the Vernacular and Learned Languages, and in the liberal Arts and Sciences.” The charter required that the makeup of the board of 36 trustees include, 22 Baptists, five Friends, four Congregationalists, and five Church of England members, and by 12 Fellows, of whom eight, including the President, should be Baptists “and the rest indifferently of any or all denominations.” It specified that “into this liberal and catholic institution shall never be admitted any religious tests, but on the contrary, all the members hereof shall forever enjoy full, free, absolute, and uninterrupted liberty of conscience.” One of the Baptist founders, John Gano, had also been the founding minister of the First Baptist Church in the City of New York. The Encyclopædia Britannica Eleventh Edition remarks that “At the time it was framed the charter was considered extraordinarily liberal” and that “the government has always been largely non-sectarian in spirit.” In commemoration of this history, each spring faculty and the graduating class proceed down the hill, in academic dress, to the grounds of the First Baptist Meeting House (erected in 1774, “for the publick Worship of Almighty GOD and also for holding Commencement in”) for the conferral of the bachelors degree.